Travelers in town for the 2019 Phillips 66 Big 12 Men’s Basketball Championship will have more on their plates than just hoops and revelry. 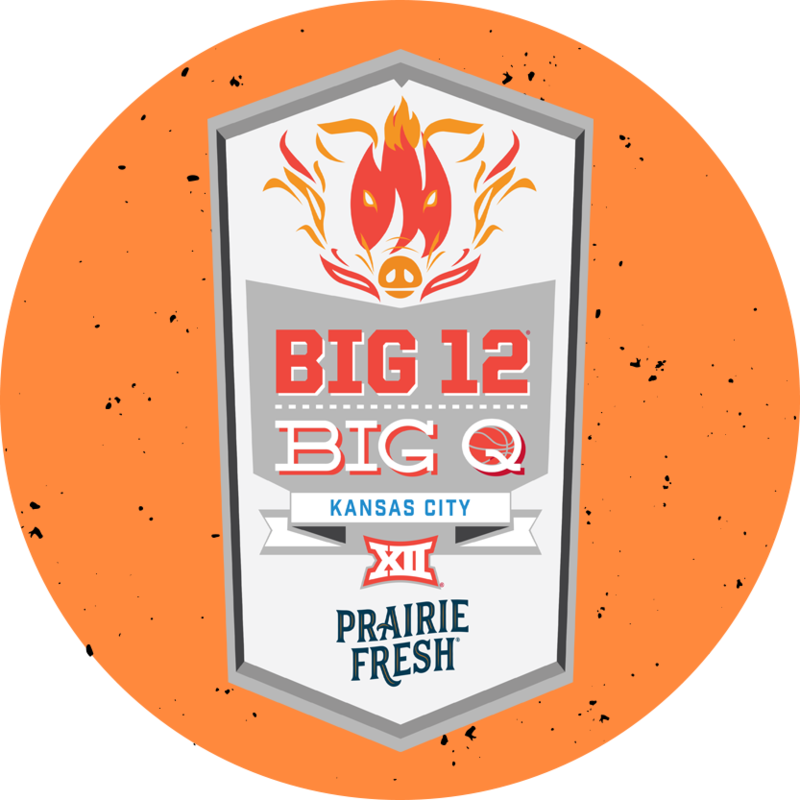 With the new KC BBQ Experience app, visitors and locals alike can track their barbecue adventures during the Championship—and earn prizes of their own along the way by embarking on the Big 12 Big Q Trail. Earn your exclusive badge by visiting two of the following 10 Kansas City barbecue restaurants. Those who earn theirs by the end of the Philips 66 Big 12 Men’s Basketball Championship—March 16 is the deadline, to be exact—will receive a custom set (2) of Big 12 Big Q stone coasters. Simply show your badge to a representative at the Visit KC booth during GameDay FanFest to collect your prize (while supplies last.) The booth is located at the intersection of 14th & Grand, directly in front of the Sprint Center. Visit KC Booth Hours: Friday 2-7:30 p.m. and Saturday 12:30-6 p.m.
Due to high winds in the area, the Visit KC booth at GameDay Fanfest will not be available for prize redemption on Thursday, March 14. The booth will return as scheduled on Friday, March 15. 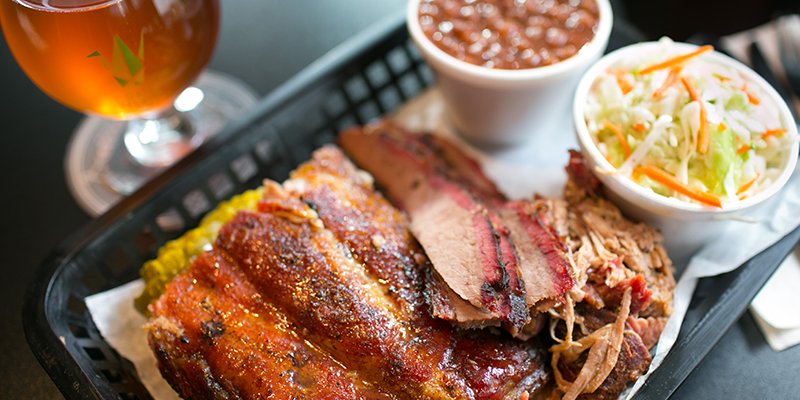 Two barbecue joints on the trail are within easy walking distance of Sprint Center and the Power & Light District, which are the home bases for every game, spirit rally, fan fest and more that go on during Championship week. First is County Road Ice House, a relative newcomer to the ‘cue scene that dishes out delicious (and internally renowned) Joe’s Kansas City Bar-B-Que for folks in P&L. Perfect before, between or after matchups. 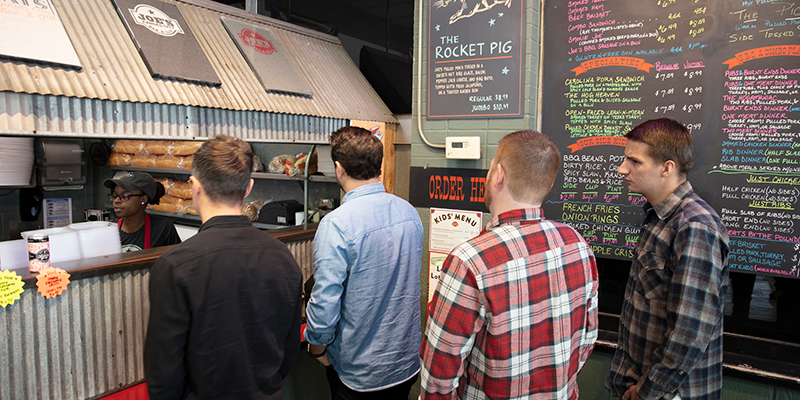 Take a break from the crowds by visiting Plowboys Barbeque, a not-so-hidden gem only two KC Streetcar stops north of Sprint Center and known for its speedy service and no-frills take on Kansas City’s signature cuisine. Not far from the heart of the action, both Fiorella’s Jack Stack Barbecue and Arthur Bryant’s Barbecue are classic establishments with deep roots in the community. Jack Stack touts several locations around the metro, the closest to Sprint Center being its Crossroads Arts District location. You can’t go wrong with any barbecue at this sit-down, table-service spot, but be sure not to skimp on sides—they’re well worth the order. 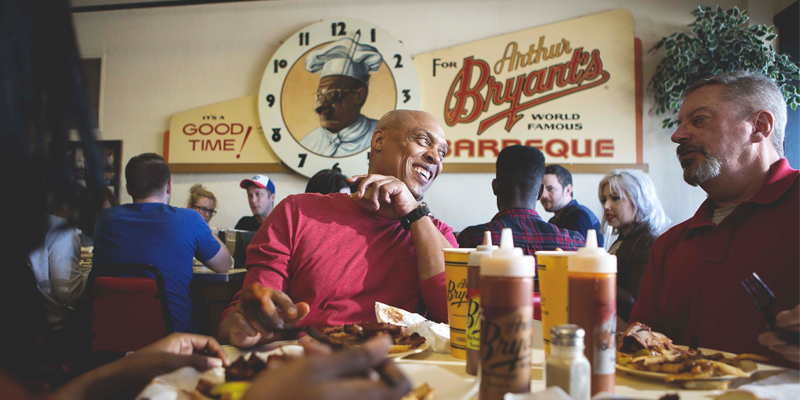 Meanwhile, Arthur Bryant’s resides in the 18th & Vine Historic Jazz District—and fittingly so, as its one of the reigning forefathers of the entire barbecue tradition. Make the trip and knock it off your barbecue bucket list. A quick car ride brings you to Westport—Kansas City’s original nightlife district—and 39th Street West, a funky, authentic strip of dining and shopping only minutes away. In Westport, KC BBQ Experience participants can treat themselves to Char Bar Smoked Meats & Amusements, a Southern-style take on KC barbecue with a hip cocktail program, yard games and an excellent patio setup. Q39 may just be one of the most popular restaurants in the city, barbecue aside. Get a reservation for a table or saddle up at the bar to enjoy the fast-smoked, high-heat delicacies this busy kitchen turns out daily. The remaining spots on the Big 12 Big Q trail stand a little further outside the Downtown region, but not to fret: short drives beget savory dining at each of these hotspots. First is Joe’s Kansas City Bar-B-Que, an award-winning and oft-televised barbecue hub known for its gas station setting and consistently amazing cuisine. Don’t miss this while you’re in town—and be prepared to wait in line. In KCK’s Strawberry Hill neighborhood, barbecue fans will find Slap’s BBQ, a cozy shack and picnic table setup that smokes up everything from burnt ends—a KC delicacy—to jalapeno cheddar sausage and saucy ribs. There’s no secret as to how Woodyard Bar-B-Que got its name: the longtime establishment (and favorite of Andrew Zimmern, Guy Fieri and the late Anthony Bourdain) began as a woodyard, serving other area barbecue restaurants before it got into the game smoking ‘cue itself. 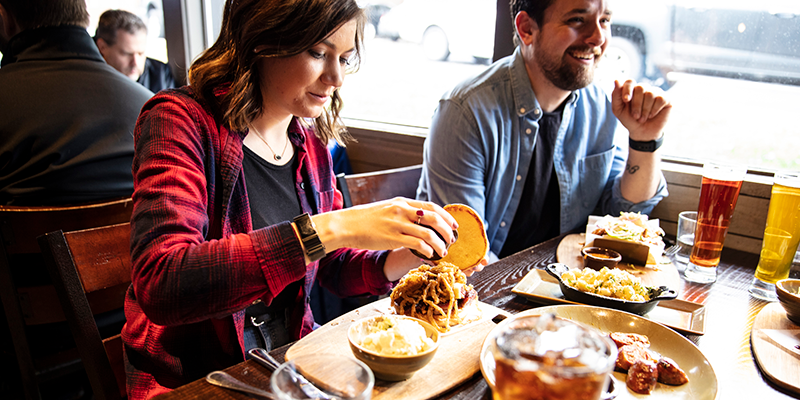 Head down south to Olathe and enjoy Crazy Good Eats, which, like many other area joints, was founded by an award-winning competition barbecue team. Sampler or signature plate, there’s no going wrong with this flavorful menu. Earn your exclusive badge by visiting two of the 10 Kansas City barbecue restaurants on the trail by March 16. Present your handywork at the Visit KC booth on 14th & Grand during GameDay FanFest to receive a set (2) of Big 12 Big Q stone coasters. Wednesday, March 13 through Friday, March 15: 2-7:30 p.m.
Saturday, March 16: 12:30-6 p.m.
Have questions? Email us at barbecue@visitkc.com.